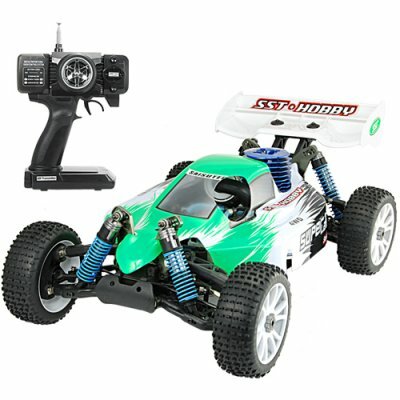 Successfully Added 1:8 Scale Nitro Race Car With Pistol Grip Remote Control (220) to your Shopping Cart. This 125cc 1/8-scale nitro fuel powered Race Car brings a whole new meaning to RC Cars. Designed to perfection with aerodynamics and an internal combustion engine, this will blow away what you ever experienced before from RC toys! The CVKM-T32 is a 4-wheel drive sports car that comes with a nitro fuel powered engine. This is for the for the guy who wants to move-up from battery powered units as well as the beginning hobbyist who wants to move up to the major leagues. Absolute raw power is what best describes this speed hungry sports RC super car. This is no ordinary toy. Carefully engineered and built to simulate real life racing with the rush and feeling you would normally get from an actual life sized race car. With this baby you get a responsive throttle, our disk brake system, solid steel gears, high torque steering, wheel rims and cube nailed tread tires, lightweight leak proof engine with solid universal joint cups, high-quality aluminum shock towers that reduce weight for improved on-track performance without sacrificing handling or strength, and the ability to mod and upgrade parts to your liking. If you are ready for excitement and enjoy working with your hands (and mind) to make your RC toy zoom across a field or track and show off your skills, then you deserve to treat yourself to the fun you will get with a nitro RC car! This fantastic nitro fueled RC super race car is in stock now and available at an unbelievable factory direct wholesale price. Get yours today from the leaders in wholesale consumer electronics, Chinavasion. Note: It is very important to read the manual thoroughly before operating this RC super race car. The manual is well written and full of detailed information. on 2010-02-02 05:42:25 Voces fornecem peças de reparo? Voces fornecem peças de reparo?